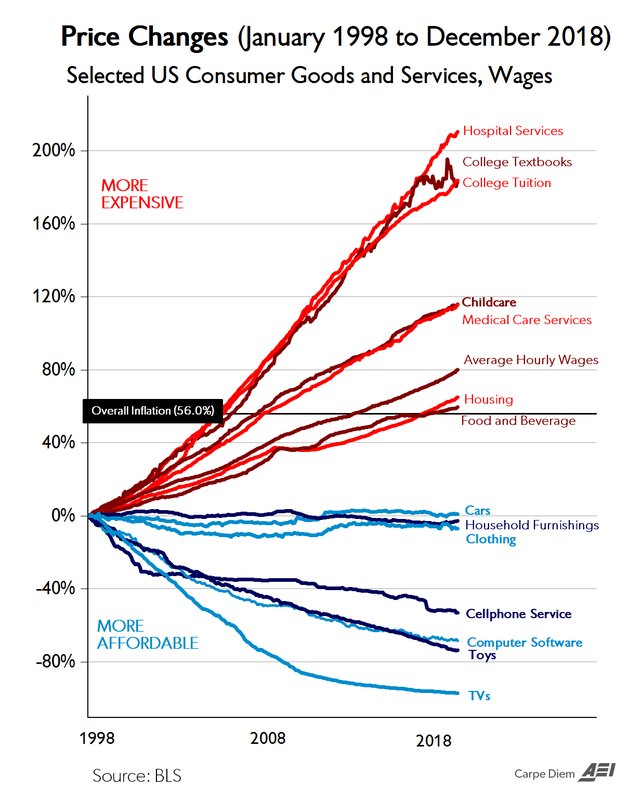 Comments on Mark Perry's CPI "chart of the century"
The chart is the inflation data of the BLS tracked by the sector where consumers spend their money, for a period of 21 years. There are many conclusions which Mark draws from the chart (about government involvement, etc.) which are unfortunately not true. However, the chart does serve to show an important point. That inflation data is largely noise: because depending on how you combine these elements, given that textbooks have gone up 180% and hospital services by 211%, vs. TVs which have fallen 97% and Software which has fallen 68%, and if you can weigh them differently you will come up with a different headline inflation number for CPI. Furthermore, it also shows that my inflation is not someone else's inflation, because the way I spend my money in these groups is not the way someone else does. An example: A retiree will spend no money on college tuition and books, whereas a student in her twenties probably spends a lot of money on them. I have shown previously the problems with inflation measurements, and this chart shows some additional confirmation of what was said there. The BLS does some quality adjustments-they call them hedonic quality adjustments, which really is using statistics to fool the public. When you buy a coke from a kiosk vs a coke in a high end restaurant or in Disneyland, you pay not for the coke, but for the great furniture and ambiance in the restaurant, and the great place that Disneyland is (once inside, you have a ton of wonderful entertainment in walking distance, that's what you pay for). Similarly, when you buy a hot dog from a street vendor vs. in a well designed mall, most of the cost of the hot dog is the privilege to be able to be in the mall. Hedonic adjustments make subjective judgments of quality and contributing factors by experts, but most of these factors are not visible. The point of the coke and hot dog example above is not to criticize the BLS experts, but simply to show that one can't determine the factors of what makes a product good or bad quality; they are sometimes hidden deep down somewhere. A store may make its parking lot bigger or better lit, put a better road connecting it to the highway, and raise prices-it is unlikely that BLS experts consider all these factors in their hedonic regression model to account for the price increase at the store. But coming back to Mark Perry's chart, one can see that the inflation data depends on how you combine all these elements and their weights; you can give me a CPI number you want, and I can combine all these to come up with that number. The deviation in the prices of the constituents is so large that there is nothing representative about a headline CPI number. This site is dedicated to two of the finest human beings I have known in my life-Fred Wittel, and my Dad. It covers many things about Economics and Life. Site uses the >. Simple theme. Powered by Blogger.